Many people will be receiving (or have already received) a tax refund in the near future. Most people that I know plan to blow it on something that will not provide a benefit for their lives. 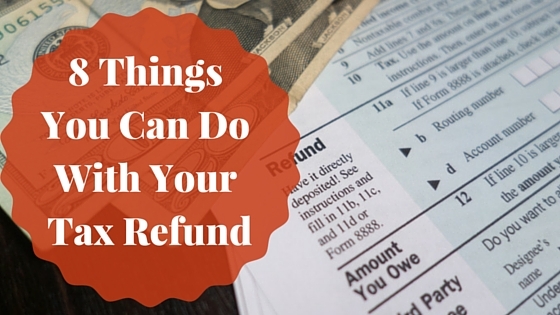 Instead of wasting your refund and regretting your decision, try one of these 8 tips! Probably the most common characteristic of a financially stable household (besides the idea of living within their means) is an emergency fund. The point of this emergency fund so you can have money stashed away when something unexpected comes up. If you are not financially prepared for emergencies, then you may be forced to rely on high-interest credit cards, or tap into your retirement savings in order to get by. Another great use of your tax refund is to pay off debt. This may seem like a boring option (especially when compared to how most people use their tax refund), but it will automatically earn a rate of return that is equal to the interest rate on your debt. For instance, if you pay off a credit card that had an interest rate of 20%, then that is equivalent to earning 20% on an investment! If you use it to pay off/down an installment loan (such as a mortgage or car loan), then you may have to specify that your extra payment should be applied to the principal. Many times it can be difficult to remember those expenses which only come once or twice each year. Instead of being taken by surprise and sent scrambling for extra cash at the last minute, either pay or put aside money for these expenses using your tax refund. Some of these can include your car insurance premium, a maintenance fee on a timeshare (don’t get me started on this one) or other property, roadside assistance fee, and any other types of subscriptions. You can easily fund a retirement account, such as an IRA with your tax refund. If you have more than the current IRA contribution limits, then you can fully fund your account while taking advantage of one of these other options. If for some reason you are not reaching the 401k contribution limits at work, you can use this extra money as a way to increase what you currently contribute. Of course, you can’t add outside money into a 401k; however, if you fall short of the contribution limit due to other expenses, you can use your tax refund to pay those other expenses and increase the amount that goes into your 401k! If you are looking to purchase a car (learn how to save money on car costs), new laptop, vacation, or any other large purchase, this may be your chance. Instead of going into debt to buy the item, you can use your tax refund. Even if the amount of your refund isn’t enough for you to purchase the item outright, it can greatly reduce the time it will take to save up for it. You can also pad the account with bonuses, raises, and future tax refunds. Giving is a very important part of any financial plan – especially for a Christian (we are commanded to give). I know many people who have a strong desire to give, but are not able because things are too tight for them financially. If you are in a situation like this, a large tax refund can provide you with the perfect opportunity to give. There are plenty of organizations that are looking for donations in order to fulfill their mission such as, your local church, a missionary, food banks and homeless shelters, and any other charity that is fighting for a worthy (to you) cause, and has proven to be reliable! One of the things that my wife and I want to do (once we are out of debt) is to establish a savings account that will only be for the purpose of providing financial blessings to others. By having a separate account for this, we never have to worry about depleting our emergency fund or any other “dedicated” savings when we come across someone in need. If you have a desire to help people out at various times, but don’t always have the means when these times come up, use your tax refund to start a “blessing fund”. I’ve talked before about celebrating small victories during your financial journey. Use some or all of your tax refund and do something that you have wanted to do, but couldn’t. Maybe go out to a fancy restaurant, or buy a New iPad or some clothes! No matter what you choose to buy, use all or a part of your tax refund to treat yourself. Then take the rest and put it toward your highest financial priority. This way, you can celebrate achieving a financial milestone, without diverting funds away from your current plan. Did you receive a tax refund this year? If so, how did you spend/save it? Do you purposely have excess taxes withheld during the year so you can have a large refund? Do you regret how you’ve spent a previous tax refund, bonus, or other “windfall”? The IRS has more than $1.1 Billion in unclaimed refunds for nearly 1.1 million people who did not file an income tax return for 2007. Many taxpayers may have chosen not to file a return because they did not earn enough income to require filing an income tax return, even though they had taxes withheld from their income. There are many reasons for you to file a return even when you are not required to do so. In order to recover your unclaimed tax refunds, you must file a return for tax year 2007. Taxpayers are given 3 years from the due date of a return in order to file – there are no late-filing penalties charged when a refund is due. Since the tax return deadline has been extended, you have until April 18, 2011 to file your 2007 return. The IRS estimates that half of these potential 2007 refunds are $640 or more. By failing to file a return, people stand to lose more than a refund of taxes withheld or paid during 2007. In addition, many low-and-moderate income workers may not have claimed the Earned Income Tax Credit (EITC). The EITC helps individuals and families whose incomes are below certain thresholds, which in 2007 were $39,783 for those with two or more children, $35,241 for people with one child, and $14,590 for those with no children. To be honest, if you any of the outstanding debt mentioned above, collecting an unclaimed refund from 3 years ago would be a great way to pay it off! This way, you don’t have to worry about taking out any unsecured loans! If you don’t have any of the above, then take a look at the IRA contribution limits and prepare yourself for retirement! Current and prior year Internal Revenue Service tax forms and instructions are available on the Forms and Publications page of IRS.gov or by calling toll-free 1-800-TAX-FORM (1-800-829-3676). Taxpayers who are missing Forms W-2, 1098, 1099 or 5498 for 2007, 2008 or 2009 should request copies from their employer, bank or other payer. If these efforts are unsuccessful, taxpayers can get a free transcript showing information from these year-end documents by ordering on-line, calling 1-800-908-9946, or by filing Form 4506-T, Request for Transcript of Tax Return, with the IRS. It may be helpful to look at your last year tax return as well. Hopefully, a few of the 1.1 million people who are due money will read this before the deadline – be sure to share this article with everyone that you know before then 😉 ! Why You Should File A Tax Return Even If You Are Not Required! In a previous article, we discussed the fact that many people are not required to file an income tax return. However, there are some instances when you may want to file a tax return even though you are not required to do so. Federal Income Tax Withheld – You should file to get money back if Federal Income Tax was withheld from your pay, you made estimated tax payments, or had a prior year overpayment applied to this year’s tax. Making Work Pay Credit – You may be able to take this credit if you had earned income from work. The maximum credit for a married couple filing a joint return is $800 and $400 for other taxpayers. Earned Income Tax Credit – You may qualify for EITC if you worked, but did not earn a lot of money. EITC is a refundable tax credit; which means you could qualify for a tax refund. Additional Child Tax Credit – This refundable credit may be available to you if you have at least one qualifying child and you did not get the full amount of the Child Tax Credit. American Opportunity Credit – The maximum credit per student is $2,500 and the first four years of postsecondary education qualify. First-Time Homebuyer Credit – The credit is a maximum of $8,000 or $4,000 if your filing status is married filing separately. To qualify for the credit, taxpayers must have bought – or entered into a binding contract to buy – a principal residence located in the United States on or before April 30, 2010. If you entered into a binding contract by April 30, 2010, you must have closed on the home on or before September 30, 2010. If you bought a home as your principle residence in 2010, you may be able to qualify and claim the credit even if you already owned a home. In this case, the maximum credit for long-time residents is $6,500, or $3,250 if your filing status is married filing separately. Health Coverage Tax Credit – Certain individuals, who are receiving Trade Adjustment Assistance, Reemployment Trade Adjustment Assistance, or pension benefit payments from the Pension Benefit Guaranty Corporation, may be eligible for a Health Coverage Tax Credit worth 80 percent of monthly health insurance premiums when you file your 2010 tax return. Well, there you have it…seven reasons why you should file a tax return even if you don’t have to do so. If you have determined that you have to prepare a return, then be sure to contact us to set up an appointment for tax preparation. If you decide to file your own taxes, we recommend using TurboTax to do so. Be sure you are aware of the tax filing delay, as well as the fact that the tax filing deadline has been extended this year. Also, you should know the IRA Contribution Limits, 401k Contribution Limits, and the Income Tax Rates for 2011!